Charlotte held Presbyterian to just 112 yards of total offense and red shirt junior quarterback Matt Johnson threw a pair of touchdowns as the 49ers downed the Blue Hose, 34-10 to improve to 2-0 in their first FBS season in front of a standing-room only home crowd on 16,631 at Jerry Richardson Stadium. Slot receiver Austin Duke caught nine passes for 166 yards and a touchdown while red-shirt freshman defensive lineman Zach Duncan led a punishing defense with five tackles, a sack and three tackles for loss. Presbyterian (0-2) was held without a first down on three-and-out possessions on 11 of their first 12 drives. Charlotte senior Branden Dozier had an interception on the other drive. The 49ers ended the game with a school-record for fewest yards allowed (112), a school-record 19 tackles for loss and a school-record for fewest passing yards allowed (9). Charlotte (2-0) scored late in the first quarter on a six-yard pass to Trent Bostick from Johnson, who split QB duties with red-shirt freshman Brooks Barden. Charlotte broke it open in the second quarter with a touchdown run by Kalif Phillips and Duke’s TD reception. By the end of the third quarter, the 49ers led 34-0, had allowed just three first downs and held the Blue Hose to 0-of-11 on third down conversions. The 49ers broke the ice late in the first quarter with the six-yard pass from Johnson to Bostick with 00:42 left. In the second quarter, Johnson completed third down passes to Duke (38 yards) and TL Ford II (13 yards) to set up a 24-yard field goal by Blake Brewer. After a three-and-out for PC, Johnson hit Bostick for a 31-yard gain and Phillips rushed untouched for a 12-yard score to make it 17-0 with 4:51 left in the half. Another three-and-out that included a nine-yard loss on Duncan’s forced fumble gave the 49ers the ball at PC’s 39-yard line. Johnson hit Duke over the middle for the 39-yard TD on the first play to put the 49ers ahead 24-0 with 3:23 to play. It was the 14th one-play touchdown drive in the 49ers short history. The quick-strike offense had produced two touchdowns less than 90 seconds apart and both came on drives of under 30 seconds. Charlotte has scored 43 TDs all-time on drives of under 1:30. Brewer hit a field goal from 35 yards and Barden, who made his first collegiate start, connected with running back Bradan Smith for a nine-yard TD pass to push the 49ers ahead 34-0 heading into the fourth quarter. It was Barden’s first touchdown pass as a 49er and and the first TD for Smith, a junior college transfer from Hutchinson Community College. Presbyterian kicked a 21-yard field goal early in the fourth and added a one-yard touchdown run by Darrell Bridges with 4:36 to play to close the scoring. 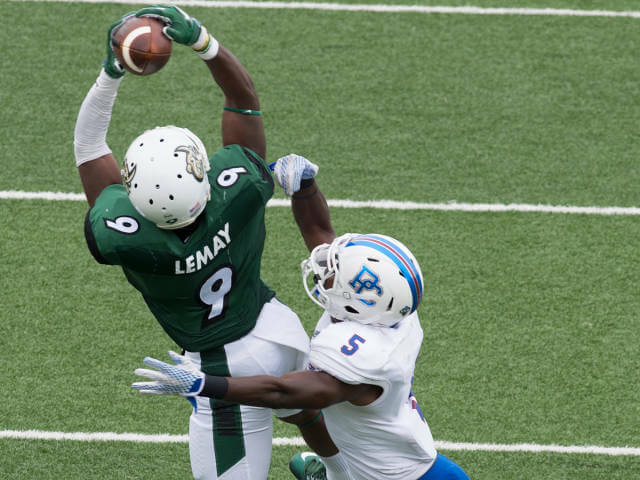 Charlotte opens Conference USA play, next Saturday, at Middle Tennessee. It will be the 49ers first league game as a member of Conference USA. Charlotte will return home to face Florida Atlantic at 7 p.m. Sept. 26. DAVIDSON, N.C. – Despite a 125-yard, two-touchdown performance from RB Jeffrey Keil, the Davidson football team fell to the Catawba Indians, 35-21, in their home opener Saturday night at Richardson Stadium. 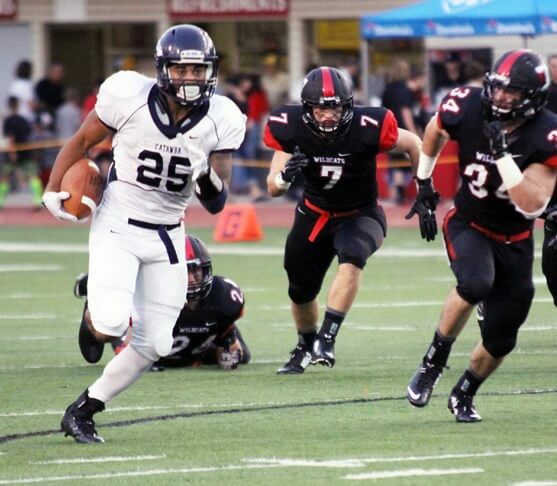 RB Cary Littlejohn led the Indians with 192 yards rushing and one touchdown on 27 carries. Senior running back Cary Littlejohn (Columbus, N.C./Polk Co. HS) ran for a career-high 192 yards – Catawba Sports Information photo. In addition to Keil’s impressive effort, WR William Morris led the ‘Cats in receiving with 76 yards and one touchdown, while QB John Cook completed 13-of-34 passes for 165 yards and one touchdown. Davidson (0-2) started the game off with an interception by DB William Curran, but Catawba (1-1) was the first to find the end zone when Littlejohn scored on a 64-yard run. The Wildcats tied the score at the 2:03 mark in the opening quarter when Keil found a hole for 21 yards that capped off an eight-play, 58-yard scoring drive. The Indians grabbed momentum at the start of the second quarter, scoring two touchdowns, converting a two-point conversion and drilling a 30-yard field goal to go up, 25-7 with 3:46 left in the half. Following an interception from DB Myles Atkins, Cook found Morris on a 42-yard reception before Keil ran it in from three yards out to make it 25-14 at the half. A 25-yard field goal and a 49-yard touchdown pass in the third secured the game for Catawba. Davidson scored its final touchdown with 5:08 left in the contest when Cook found Morris open in the corner of the end zone from 12 yards out. Defensively, Atkins and DB Ryan Felice led the Wildcats with a career-high 10 tackles each, while LB Ben Rowell picked up his first-career sack for a loss of 11 yards in the fourth quarter. The Wildcats will enjoy a week off before returning to the gridiron Saturday, Sept. 26 at PFL foe Morehead State. Kickoff is set for 1 p.m.
Durham, N.C. – Wingate University sophomore running back Lawrence Pittman (Charlotte, N.C.) rushed for a career-high 147 yards on 20 carries with two touchdowns, helping the Bulldogs take a 30-16 NCAA Division II football victory over Shaw University Saturday night at Durham County Memorial Stadium . Wingate improves to 2-0 overall following the first-ever meeting between the Bulldogs and the SU Bears. Shaw is 0-2 overall. Wingate opens the home portion of its 2015 schedule Saturday, hosting Brevard College for a 1:30 p.m. South Atlantic Conference game. Shaw visits UNC Pembroke the same day at 7 p.m. The Bulldogs led 30-0 early in the fourth quarter before the Bears scored a safety and two touchdowns in the final six-plus minutes of the contest. Wingate junior wide receiver Jordan Berry (Irmo, S.C.) registered his fifth 100-yard receiving game, catching eight passes for 113 yards and one score. Bulldog redshirt junior quarterback Kyle Johnson (Hickory, N.C.) completed 17-of-30 passes for 193 yards and one TD. Wingate’s first possession featured the longest drive for either team Saturday. The Bulldogs moved the ball 98 yards on 12 plays, consuming 4:50 from the game clock. Pittman carried the ball six times on the drive, including his nine-yard, drive-finishing touchdown run. Bulldog junior place kicker Caleb Baird (Kinston, N.C.) nailed the first of his four PATs to make the score 7-0 visitors with 6:33 left in the first quarter. A 23-yard SU punt gave Wingate great field position (WU 44) late in the opening frame. On the first play of the second quarter, Kyle Johnson did the honors with his second rushing TD in as many weeks. Johnson scored from five yards out, concluding a four-play, 56-yard drive. Baird’s extra point gave the Bulldogs a two-touchdown lead at the 14:53 mark of the second stanza. Shaw turned the ball over on downs, setting the stage for Pittman’s second TD run. The Mallard Creek High graduate had three rushes on the drive, which covered 57 yards on seven plays. Pittman’s four-yard scoring run gave the visitors a 21-0 lead after Baird’s PAT with exactly eight minutes left in the second quarter. A Johnson-to-Berry touchdown connection concluded the first half scoring. The Bulldogs had a short field, as freshman wide receiver Malik Bledsoe (Culloden, Ga.) made a big special teams play by recovering a fumble by the Shaw punter. Bledsoe returned the ball 10 yards to the Shaw 10-yard line. Three plays later, Berry found pay dirt after a two-yard scoring strike from Johnson at the 1:48 mark. The two teams traded fourth quarter safeties before the Bears found their offensive groove late in the contest. Shaw senior quarterback Quenton Rucker (Atlanta, Ga.) connected with sophomore wide receiver Trevante Long(Charlotte, N.C.) on an 82-yard touchdown pass for the Bears’ first offensive TD of the season. Shaw specialist Danny Webster, Jr. (New Bern, N.C.) added the PAT to make the score 30-9 Wingate with 5:08 left in regulation. Rucker finished a quick six-play drive with a 21-yard scoring pass to senior wide receiver Artravius James (College Park, Ga.) at the 1:49 mark. Webster booted the extra point to conclude the night’s scoring. Wingate senior defensive back and team captain Nortavius Otis (Gastonia, N.C.) had eight tackles with six solo stops to lead the Bulldogs. Wingate redshirt senior defensive end Dillon Tucker (Denver, N.C.) was one of three WU players to record four tackles. Tucker filled out his statistical ledger with a fumble recovery and a shared quarterback sack. Frankfort, Ky. – The Johnson C. Smith football team withstood an early turnover and limited Kentucky State to only 56 yards rushing while intercepting three Thorobred passes en route to a 38-14 road win at Alumni Stadium in Frankfort, Ky.
On the first JCSU drive, the offense struggled to get going, as Kentucky State recorded a sack on first down and two plays later, Herbin’s pass was picked off by KSU’s Nathan Robinson. On the first Thorobred drive, KSU also fell victim to the interception, as JCSU’s Dave Mann (Atlanta, Ga.) stepped in front of an Ora Johnson pass, giving JCSU the ball at their own 40 yard line. On the first play of the new drive, Kentucky State’s Raymond Malone scooped up a JCSU fumble and raced 44 yards for the touchdown. The point after attempt was good, staking KSU to the early 7-0 lead at the 12:38 mark. The Golden Bulls would respond quickly. Following a 45 yard kickoff return by Carlo Thomas (East Orange, N.J.), JCSU’s Tromecio Summers (Charlotte, N.C.) ripped off a 39 yard rush to take it to the KSU 7 yard line. Playing in his first collegiate game, Harold Herbin (Fayetteville, N.C.) had a bootleg rush to the KSU one yard line, he punched it in for the first touchdown of his career. Erik Amaya (Kannapolis, N.C.) knocked in the point after attempt was good to tie it at 7-7 at the 10:52 mark in the first quarter. Amaya would then put JCSU on top 10-7 when he converted a career-long 41 yard field goal at the 6:51 mark following a KSU turnover. On the first play of the second quarter, JCSU’s Javard Gaines (Newark, N.J.) broke through to block the KSU punt, returning it to the KSU 16. Five plays later, Herbin found junior receiver Roderick Carter (Miami, Fla.) in the corner for an 11-yard touchdown strike. Amaya’s PAT boosted the JCSU lead to 17-7. The Golden Bulls would add another touchdown in the second quarter, this time from freshman running back Desean Binyard (Winston-Salem, N.C.), when he pushed through for a one yard score. Amaya again added the extra point to push the lead to 24-7. Neither team was able to get much offense going in the third quarter, but KSU struck at the 6:50 mark. With JCSU pinned deep in their own territory, KSU’s Malone stepped in front of an errant Herbin pass, scoring from three yards out. The successful point after attempt cut the JCSU lead to 24-14. JCSU struck on it’s first drive of the fourth quarter when Herbin found Bryan Chambers for a 12-yard touchdown strike, boosting the lead to 31-14. Kentucky State would embark on a promising drive, but the JCSU defense stiffened and forced a 49-field goal attempt. JCSU safety Keith Darnell blasted through the KSU line to block the attempt, then scooped the ball and took it 53 yards for a touchdown, extending the JCSU lead to 38-14. On the next KSU possession, JCSU’s Alfred Mickle picked off a wobbling Ora Johnson pass to seal the game. JCSU would go on to melt the clock, taking the 38-14 road win. Offensively, JCSU rushed for 132 yards, getting 55 from Summers and 42 from Binyard. On the receiving end, Carter hauled in in four passes for 31 yards and one score. Fred Scott(Stone Mountain, Ga.) caught one pass for a game-long 28 yards. Defensively, the Golden Bulls were led by Carlo Thomas‘ five tackles, four of which were unassisted. Thomas also had one interception and a pass breakup. Senior LinebackerAustin Jacques (Springdale, Md.) had four tackles with one being for loss. Defensive lineman Jamaal Tutt (Atlanta, Ga.) recorded four tackles on the day and had one sack for a 16 yard loss. 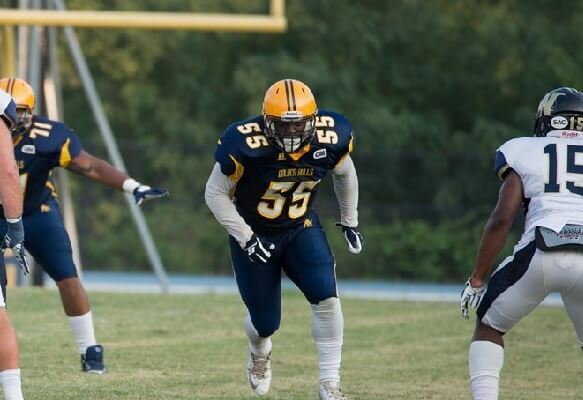 Travon Leake-Anderson (Richmond, Va.) and Brice Smith (Atlanta, Ga.) also recorded sacks for JCSU in the win. All told, the JCSU defense had eight tackles for loss and forced four KSU turnovers on the afternoon while limiting the Thorobreds to only 132 yards of total offense on the afternoon. The Golden Bulls will remain on the road next week, travelling to Morehouse on Saturday, Sept. 19 for a 7:00 p.m. tilt against the Maroon Tigers. The 49ers improved their all-time record to 12-12 and their record as an FBS school to 2-0. The 49ers are 3-0 all-time in their first home game of the year. The 49ers have led opponents 44-3 in the first half, this year and are 11-0 all-time in games in which they have led at the half. Barden and RS-Junior Matt Johnson both saw significant time at quarterback. Johnson was 8-of-11 for 187 yards and two TDs. Barden was 11-of-17 for 77 yards and one TD. The three passing TDs are the most by the 49ers since throwing for four at the Citadel, Oct. 11, 2014. Austin Duke had 166 receiving yards for his 8th career 100-yard game and fourth career game with 150+ yards. It was his first 100-yard game of the season. Austin Duke’s 166 yards is third on the single-game receiving records. Duke holds the top-eight single-game receiving spots. When Johnson hit Duke for a 39-yard TD on the first play of their fourth drive of the second quarter, Charlotte had notched its 14th all-time one-play TD drive. That one-play TD drive took just 00:07 – the shortest TD drive in school history. The one-play 39-yard TD drive (00:07) from Johnson to Duke and the preceding two-play drive capped by Kalif Phillips’ 12-yard TD run (00:27) gave the 49ers two more TD drives of under 90 seconds. The 49ers have had three such drives this year and 43 in the school’s three-year history. The 49ers 13-play, 69-yard drive that resulted in a 24-yard Blake Brewer field goals was the longest scoring drive in school history in regards to time of possession at 5:07. Trent Bostick had a 6-yard TD reception from Johnson – it was his first TD of the year and 7th of his career. Kalif Phillips scored the 49ers first rushing touchdown of the season with his second quarter, a 12-yard rush. Phillips now has 33 career rushing touchdowns. Brooks Barden threw his first career touchdown pass with a nine-yard TD pass to Bradan Smith in the third quarter. It was also Smith’s first career touchdown reception. Andrew Buie led the 49ers with 80 yards – his career best in a Charlotte uniform. Previous career best came with 56 yards against Georgia State Sept. 4, 2015. Buie’s team-high 80 yards rushing snapped a nine-game streak in which Kalif Phillips was the 49ers leading rusher. Buie’s 29-yard run was the 49ers longest rush of the season. Charlotte’s defense set records for fewest yard allowed (112), fewest passing yards allowed (9) and most tackles for loss (19). The 49ers forced three-and-out punts on 11 of 14 drives by Presbyterian, including 11 of the first 12. One drive by Presbyterian went -15 yards in three plays, thanks to Zach Duncan’s forced fumble. That is the shortest drive, by yardage, the 49ers have allowed, all-time. The 49ers held Presbyterian to 1 of 13 on third-down conversions. In two games, opponents are 4-of-28 on third down (14%). Charlotte defense held Presbyterian to a program low of 112 yards, breaking the previous record of 197 yards allowed against Johnson C. Smith Sept. 6, 2014. 14 different 49ers had a tackle for loss as Charlotte produced a school record 19 tackles for loss. Larry Ogunjobi and Zach Duncan led the squad with 3.0 TFL’s each. Ogunjobi leads the 49ers with 4.0 TFLs this season and now has 25 in his career — the first 49er to reach that milestone. Tank Norman’s five tackles pushes him to the 100-tackle mark for his career. He is the second 49er to reach the 100-career tackle plateau. Norman leads the team with nine tackles, this year. S Branden Dozier, who had three takeaways last year, pulled down his first interception of 2015. Junior K Blake Brewer (Concord, N.C./Cannon School) became the first Charlotte 49ers player to earna Conference USA Player of the Week award when he was named C-USA Special Teams Player of the Week after Week 1. Players of the Week are voted on by a panel of the league’s media. Brewer was 3-of-3 on field goal attempts and added two PAT’s in a perfect kicking perfomance that helped the 49ers defeat Georgia State, 23-20, in their FBS debut. Brewer connected from 45, 35 and 22 yards and kicked what proved to be the game-winner in the three-point win. His 45-yarder was the ninth successful kick from 40 or more yards in his career and he matched his own school record for most field goals made (3) without a miss. TL Ford II caught five passes – each one for a first down, twice on 3rd and long (3rd & 10; 3rd & 9) Matt Johnson was 10-of-12 on third down with 7 completions for first downs. On three of four scoring drives, Johnson completed a 3rd and long for a first down to keep the drive alive. Terrance Winchester scored the sixth defensive TD in 49ers history and the second fumble return for a TD in school history. Winchester tied the school record with two takeaways in a game (FR; INT) and joins Greg Cunningham (2014) and Micah Bryan (2013) as the only 49ers with both a fumble recovery and interception in the same game. Charlotte is 5-1 in games in which it scores a defensive TD. Winchester’s TD came just 1:32 into the game. It was the fourth fastest TD in school history. Austin Duke’s 63-yard TD catch is his eighth career TD catch of 60 or more yards. 7 of Duke’s last 8 TD catches have been 60 or more yards. Matt Johnson threw a TD pass for his eighth straight game (7 games before injury, last year). Johnson and Duke have connected for 8 career TD passes of 60+ yards. The TD drive took 1:21. The 49ers had 22 TD drives of 1:30 or less, last year. His 45-yarder is the 9th FGM of 40+ in his career. LB Nick Cook, who missed all but one game, last year, forced a fumble and had a fumble recovery while leading the 49ers with six tackles (six solo). S Branden Dozier, last year’s leading tackler, shared the game-high with six tackles (five solo). Defensive linemen James Middleton (2.0), Larry Ogunjobi (1.0) and Devon Johnson (1.0) each had at least one tackle for loss. Kalif Phillips had 19 carries (90 yards), Matt Johnson had 17 carries (32 yards) and West Virginia transfer Andrew Buie had 16 carries (56 yards). Last year, Phillips (229 carries) had 52% of the 49ers rushes. The 49ers lost the turnover battle, 5-3 – the second time in 49ers history that they won the game despite losing the turnover battle. Charlotte beat Wesley, last year despite losing TO battle, 3-2. The 5-3 margin is the largest TO deficit that the 49ers have had, yet still won. Charlotte improved to 10-0 in program history when it leads at the half. Dating back to last year, the 49ers have won three straight games. The 49ers host Presbyterian (FCS) Saturday, Sept. 12 at 12 noon (ASN/WCCB). Charlotte is 1-0 vs. Presbyterian. The 49ers posted their first FBS road win at Presbyterian, 45-21, in 2013. The two teams also faced each other when the CCUNC was a two-year institution playing a combination of varsity, JV and B teams from 1946-48. CHARLESTON, S.C. – The Davidson football team fell to The Citadel Bulldogs, 69-0, in their season opener Saturday evening at Johnson Hagood Stadium. In addition to 602 yards on the ground and eight rushing touchdowns, The Citadel (1-0) held the Wildcats (0-1) to just 104 total yards. Running back Evan McField recorded a game-high 132 yards off 20 attempts with one touchdown, while Isiaha Smith ran for 109 yards and scored three touchdowns to lead both teams. Defensively, the Bulldogs held Davidson (0-1) to just 46 yards rushing, while forcing four interceptions. Linebacker Zack Popovec led both teams with a career-high nine tackles for the Wildcats, while defensive lineman Chris Woods and defensive back Ben Rowell each tallied a personal-best eight tackles. SALISBURY, N.C. — NCAA II fourth-ranked West Georgia scored 28 unanswered points in the second half to claim an opening 44-13 win over host Catawba on Saturday afternoon at Shuford Stadium and Kirkland Field. The Wolves overcame five turnovers in the win, forcing four and holding the Catawba Indians to just 145 total yards. Quarterback Dallas Dickey was nearly perfect for West Georgia, completing 15-of-17 passes for 204 yards and a pair of scores. He also ran for a touchdown. Aares McCall eclipsed the 100-yard mark on the ground with 107 yards on 11 carries. Dickey threw both of his touchdown strikes in the third quarter to help the Wolves break away from a 16-13 lead at the half. His first strike went for 47 yards to Qa Walker and the second went to Shaq Hall for 29 yards to push the margin to 30-13 midway through the period. West Georgia tacked on two fourth-quarter scores for the final margin. Cary Littlejohn (Columbus, N.C./Polk Co. HS) produced the lone Catawba touchdown with a five-yard run late in the second quarter to pull the Indians within 16-13. He finished with 57 yards on the ground. Bruce Smith (Winston-Salem, N.C./N. Davidson HS) caught three passes for 22 yards. Kyle Kitchens (Decatur, Ga./Decatur HS) had a big day on defense for Catawba. He was in on seven tackles with three going for losses, including a sack. He would force two fumbles and recover one. Charlotte, N.C.—-Wingate University redshirt junior quarterback Kyle Johnson (Hickory, N.C.) passed for a touchdown and rushed for a score, leading the Bulldogs to a 14-0 victory over Johnson C. Smith University Saturday night at the Irwin Belk Complex and Eddie McGirt Field. The contest was the season opener for both teams. The shutout is Wingate’s fifth during the school’s senior college football history (1986-present). Four of Wingate’s five shutouts have come at the expense of CIAA members. The Bulldogs blanked Saint Augustine’s 30-0 last season (Sept. 13, 2014) and Fayetteville State 19-0 on August 26, 2006. Wingate opened the 2002 season with a 24-0 decision over the JCSU Golden Bulls (August 31). Johnson completed 15-of-20 passes for 143 yards and one touchdown. He rushed six times for 51 yards. The two-year team captain opened the Bulldogs’ scoring with a nine-yard TD run in the first quarter. Johnson’s scoring scamper concluded a 13-play, 80-yard drive. Wingate junior place kicker Caleb Baird (Kinston, N.C.) added the PAT to make the score 7-0 ‘Dogs with 8:27 left in the first frame. Wingate took the slim margin to the halftime locker room. Johnson and his offensive teammates struck again in the third quarter, putting together an eight-play, 79-yard march to take a two-touchdown margin. Bulldog redshirt junior wide receiver Jody Fuller (Indian Trail, N.C.) did the honors, hauling in a 38-yard TD pass from Johnson. Baird’s extra point concluded the scoring with 5:52 remaining in the third stanza. The Bulldogs forced three fumbles to win the turnover margin 3-1. In his first game in the Navy Blue and Vegas Gold, redshirt freshman Robert Wallace (Covington, Ga.) had a team-best eight tackles with three tackles for loss (14 yards), 1.5 quarterback sacks (13 yards) and one fumble recovery. Three Wingate defenders had six tackles each. Wingate senior defensive back Nortavius Otis (Gastonia, N.C.) forced the fumble which led to the Bulldogs’ second score. The JCSU Golden Bulls had second-and-two on the Wingate 23-yard line when Otis made his big play. Robert Wallace recovered and the Bulldog offense went to work. Wingate sophomore running back Lawrence Pittman (Charlotte, N.C.) made a triumphant return to his hometown, rushing 19 times for 94 yards (both career-highs). The Mallard Creek High School product also caught one pass Saturday night. Both Fuller and junior wide receiver Jordan Berry (Irmo, S.C.) caught five passes each. Fuller had five catches for 64 yards and one touchdown. Berry recorded five receptions for 39 yards. Wingate redshirt sophomore tight end Jake Jensen (Fayetteville, N.C.) had two catches for 23 yards. Wingate hits the road again next week, visiting Durham County Memorial Stadium to face Shaw University (6 p.m. kick-off). The WU Bulldogs and SU Bears will meet for the first time in history. Johnson C. Smith is also on the road next Saturday, visiting Kentucky State University.